Student debt, a university's admissions policy and making new friends... typical concerns for the average teenager? With 10,000 fresher-hopefuls descending on the University of Bristol's open day, BBC News Online went along to find out. Competition for places is tough in some subjects: the university attracts the most applicants per place in England and became embroiled in a row over its admissions policy earlier this year. The university says it was - falsely - accused of bias against the independent sector because it takes the "educational context" of A-level pupils into account when offering places. While many teenagers had never heard of this and did not seem that concerned, others felt it was discriminatory - a charge strongly denied by the university. Julia, 16 from Oxford, said: "It is all the same exams. The fact that you go to a private school doesn't matter." 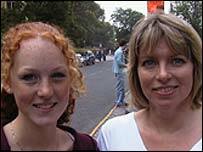 Parent Susanne, from Cambridge with her 17-year-old daughter Emma, agreed: "She is at a good private school, but has only been there since the sixth form. "She did very well in her GCSEs at a state school to get in and it is unfair that she may be penalised." In fact, Bristol University takes in a higher proportion of its students from the independent sector than any other university in the UK, except for Oxford and Cambridge. This in turn has led some in the state sector to complain about bias against them. Caught between a rock and a hard place, the university is adamant that it has to reject many talented students from both the state and private sectors due to the extreme competition for places in some subjects, such as English and law. Elise, 17, from Poole, said: "I think the privilege of going to a private school means it is easier to get A grades, but if you are intelligent and work hard you will get them anyway." Her friend Natalie, also 17, added: "They should offer grades on your achievements - not on where you come from." A spokesperson for Bristol University has previously told BBC News Online: "It is not a disadvantage or an advantage to attend a particular type of school. "There are no quotas for the private or state sector and no departmental targets. Emma said the admissions row was "silly"
"We want to maintain our commitment to widening participation and encouraging the broadest possible spread of applicants from all social and educational backgrounds." The university can take heart that almost all the prospective freshers were making their choice based on the institution's reputation - and the strength of its departments. Richard, 16, from Hampshire said: "It had a good prospectus and a good course. I don't know anything about the city. "I hope to get a good degree, have a good three years, make some friends and have a laugh." But the teenagers were well aware of what faced them after they had enjoyed their new-found independence: debt. Richard said: "It is worth it. If you don't come to university, you are less likely to get a well paid job. You can clear your debt with this. " And Ruth,17, from the Wirral, added: "Debt does worry me, but it is a necessary evil. "But if you don't go to university, you may end up with a lower paid job and possibly then accumulate more debt later in your life for longer." Being resigned to years of debt may be an oddity to students of previous generations, but these teenagers - and their parents - know they have little choice. Although - and those interested in voter apathy take note - some did mention they would be prepared to vote for a political party that abolished fees and loans.